Having a poisson-distributed random variable X, how can we efficiently generate samples (or say realizations) of that random variable? This article shows how Knuth’s technique can be derived and it also indicates that the Ratio-of-Uniforms method is quite efficient. This number k is the sought-after random sample. Usually, the inversion method is used for sampling from an exponential distribution. 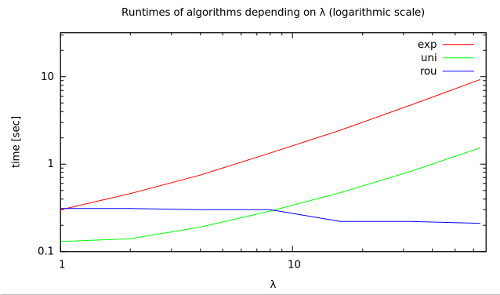 Finding a k that satisfies the last inequation only requires λ+1 uniform samples on average, reflecting in shortened computation times. No explanation here (unfortunately…). Just take the algorithm from Numerical Recipes and see what it’s worth. Actually, I modified it to use Ratio-of-Uniforms for all values of λ for the sake of comparison. Sources are licensed and therefore cannot be listed here. Taking different values for λ (1, 2, 4, 16, 32, 64) and generating a million random samples using each of the three algorithms on a notebook from 2008, here’s the results (interpolated). benchmark.zip : In order to compile, you need to obtain files nr3.h, ran.h, deviates.h, gamma.h from Numerical Recipes and put them into the folder with the other source files.